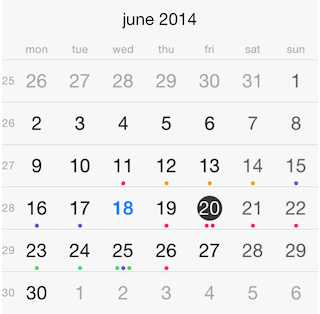 This quick start tutorial demonstrates how to create a simple iOS application with TKCalendar. Since iOS 10, Apple requires explicit description when NSCalendar is being used, more precisely when one is trying to access the phone's calendar events. This description is prompted to the user, only when there is an attempt for accessing events, and requires user's confirmation. If you are using TelerikUI but never accessing device's calendar your users won't get prompted with this message. In order to submit your application to the AppStore make sure to include a NSCalendarsUsageDescription variable to your info.plist and provide some description, for example "This application need to acces your calendar events." This code creates a new instance of TKCalendar and adds it as a subview of the ViewController's main view. The autoresizingMask property is set in order to allow correct resizing of the calendar when the device is rotated in landscape mode. This code will add 10 events with random dates to an array named events. The arc4random method is being used to create the random dates. The code also assigns a title and a color to the events. Note that TKCalendar supports single, multiple and range date selection. Selection modes are described in detail in the article about Selection. Along with selection notifications TKCalendar supports navigation and customization notifications by adopting the TKCalendarDelegate protocol. These notifications are described in the articles about: Navigation and Customizations.